1️⃣I haven't been using this long and actually barely use it, as I currently don't have much use for any mascara these days, so I'll def update this review with greater detail by the end of the summer. 2️⃣So far, I'm seeing that this is a product for the following lash types: short, long, light, & curly. The bristled brush is firm. You only need a gentle eye make up remover to remove this product, so that's nice that I can use my regular one and won't have to go out and buy something "stronger" to remove this. 3️⃣At the time of writing, this is $28 on both the official website and at Sephora. I got this as a sample from another subscription-type service to test out, but won't be buying it in the future. That's not to say it isn't a good product or anything, I just have super light skin so I'm needing products with a higher SPF, personally. I like to go ahead and use any samples I get or give them to my family/friends, if possible. I used this one because don't use primer in general, so figured I'd go ahead and check it out. I shared this with my 16yo sister, so you can get a decent amount of uses out of the sample size. I can only imagine how long the full size would last! Applied before other cosmetics, this particular product is supposed to improve coverage & extend the amount of time the makeup lasts on your face. 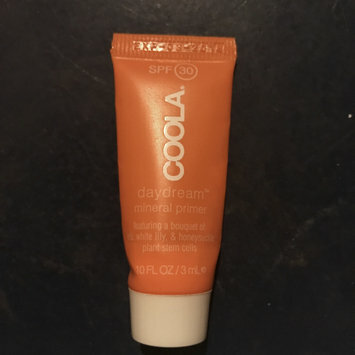 I didn't use anything over this primer when I wore it, so I didn't exactly find that out myself. I focused on other things. The texture of this product is nice, like a velvety smooth type; it kinda makes me think of what you would see with some airbrush feature, actually. Matte would be a better word, I guess. It was lightweight for me, as I didn't really feel it there after I put it on. The price seems expensive for me, but again, I don't use this type of product in general so, I wouldn't know if it's "worth" the price. 1️⃣ I mostly use the mobile app to mobile order/pay. I use it also to save my favorites. 2️⃣ The mobile app has definitely been a huge help for when I am driving across the country, as I can just pull up a location in the next city, click one of my favorites, and order it when I'm a certain distance away as the time it will take for me to get there is usually a few min longer than it estimates that my order will be ready. I'm able to pull up, park, run in to grab my order, run back to my car and get back on the road all within a matter of 3/4 minutes of exiting the highway I was on. 3️⃣ It's pricey for some reason but people don't mind paying for it. I know I certainly have a few favorites here, and the "stars" to prove it! I have the rewards program so the money I spend here is a bit more worth it to me. I honestly didn't even go to Starbucks before I learned they had a rewards program that was actually fairly decent. 1️⃣I have not read the vampire horror novel of the same name; The Strain was adapted into a vampire horror drama television series of 4 seasons, with 46 episodes total. 2️⃣If you are into vampire stuff (or were as a younger person, am I right?) and are interested in a different version of the vampire story, try this series. I feel it was underrated, for sure. This had a very new take on the vampire genre. Instead of taking the mythical/magic approach like other stories, this took a more scientific approach, with the vampires being created by virus so it was treated like an infection. 3️⃣The show has a dark tone that is very vivid and effective. It does have some action/gory scenes which I thought were done pretty well, considering the small budget. So, it can get kinda scary on some parts because of that for some people or because of the more "gross" scenes. You'll understand if you give it a shot. I can't describe it here. At times, the show does have points where it drags on where you kinda feel it shouldn't, but I feel that happens with a lot of series with smaller budgets. Ok, I didn't watch this until the end of season 7. Like, I didn't have the ability to watch it so when I got to, you best believe I binged it because HOW CAN YOU NOT? Once you start the show and get a good 3 episodes in, you'll know if this is a show for you or not. I always give shows 3 episodes to grab my attention and all of that and this did it for me. Came to realize that I had to wait an ENTIRE YEAR to see the final season, so that was annoying but it just gave me the excuse to rewatch the series before the premiere of the new season. Omg, this was the kind given to me in the hospital and it ended up being the ONLY one my child would take. I def recommend, considering there are even soothie bottles available so when I had to switch to bottle feeding after breastfeeding, I didn't have to worry how he would do with bottles since he was used to the part already! When I was buying them (almost 10 years ago! ), they came in two packs. There was a difference in buying the green and blue (blue is harder) so keep that in mind for smaller babies. I'm guessing those are for when the kids get older, if they are still using them. 'Clorox Bleach Foamer for the Bathroom' removes mold and mildew stains, so if that's an issue for you, this product is what you are looking for! This specifically works on tubs, tile, toilets, sinks and counters, but honestly, you could probably be safe using it in a few other places.